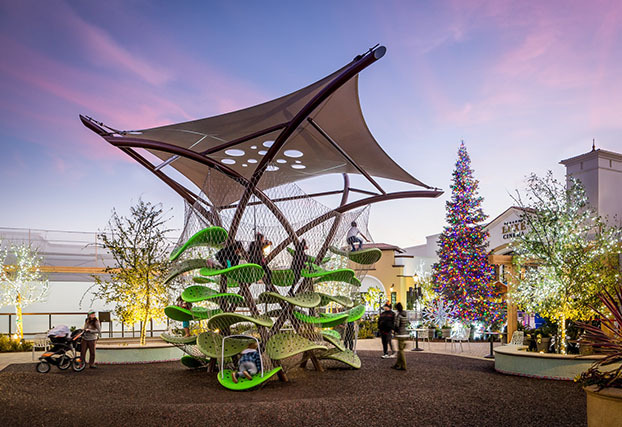 Luckey LLC is bespoke design-build firm specializing in creating unique, imaginative climbing structures for children-oriented institutional and commercial clients. Positioned in the greater New York City area, we collaborate with clients across the globe to create signature sculptural works. 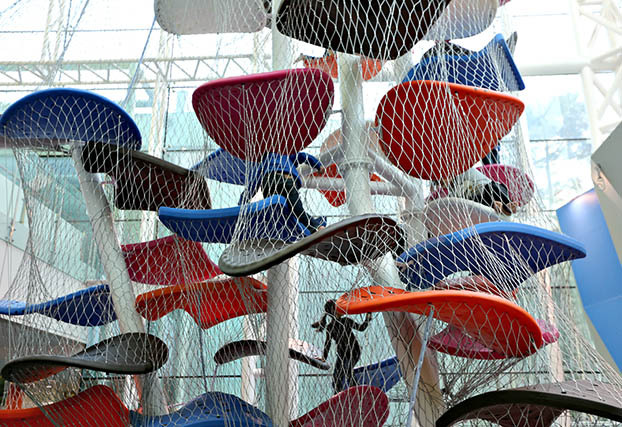 Our Luckey Climbers are three-dimensional sculptures that define public spaces, encourage physical activity, and offer the sort of imaginative play experience important for the intellectual development in children. 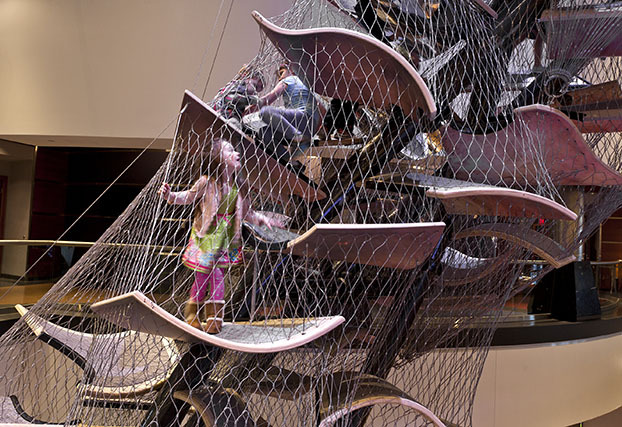 Made of bent plywood or rotational molded plastic platforms suspended by steel pipes and cables, Luckey Climbers are visually elegant works of art, part jungle gym, and once alive, they become fountains of children. Each Luckey Climber is unique. Please contact our office directly to discuss your needs. 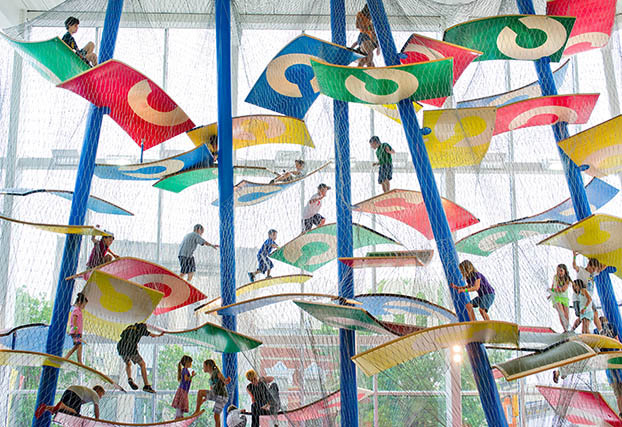 Columbus Commons, Columbus, Indiana – Situated in an indoor public park, this Luckey Climber is an example of the potential synergy between the beauty of the play structure and the architecture that surrounds it. The Veranda, Concord, California – Northern California’s first Luckey Climber resembles a tree standing 21’ tall with a canopy spanning 27’ wide. 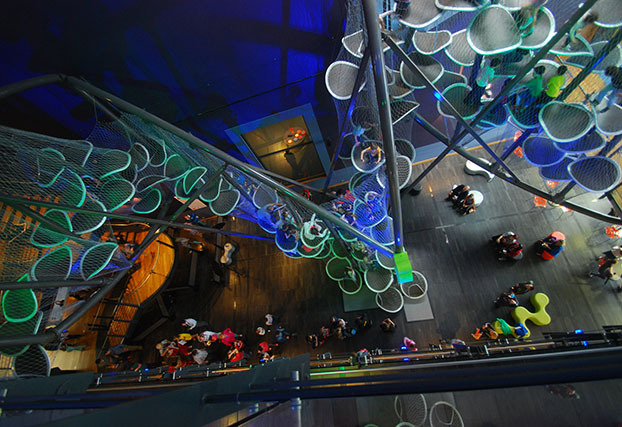 Liberty Science Center, Jersey City, New Jersey – An expression of relativism, visitors can choose to get lost or find their way on an infinite circuit of routes. 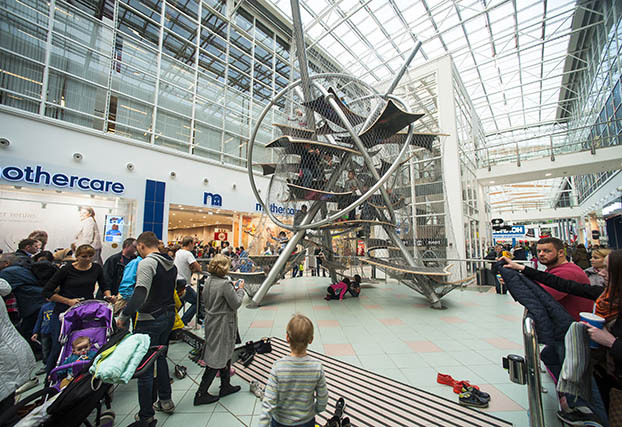 IKEA MEGA Teply Stan, Moscow, Russia – With images from the NASA Hubble Space Telescope, this Luckey Climber gets inspiration from Sputnik, the atom symbol, orbiting planets, and space aliens. 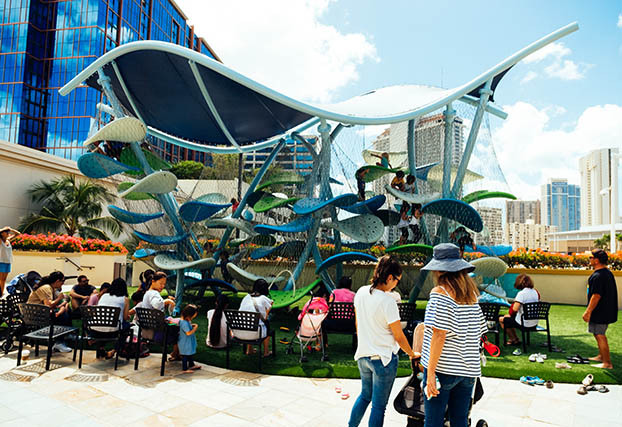 Ala Moana Center, Honolulu, Hawaii – Inspired by the motion of the ocean, this Luckey Climber depicts fluidity and elegance. Clay Center for the Arts & Sciences, Charleston, West Virginia – Climbing over 50 feet in the air, visitors bend and flex their way to the top resulting in an unforgettable view. W5, Belfast, Ireland – One of our largest Luckey Climbers, this Celtic dragon abstracted in steel invites visitors to climb the span of its arched wings. Gyeonggi Children’s Museum, Gyeonggi, South Korea – Over 50’ tall, this Luckey Climber was conceived to evoke a child’s construction made of bendy straws. 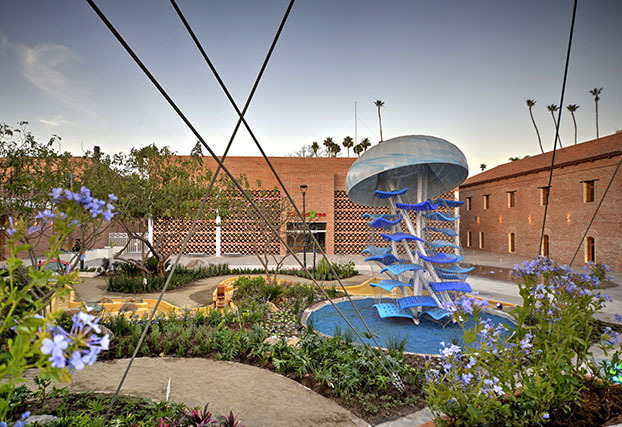 Trapiche Museo Interactivo, Los Mochis, Mexico – Inspired by the billowing cup form of the medusa jellyfish. 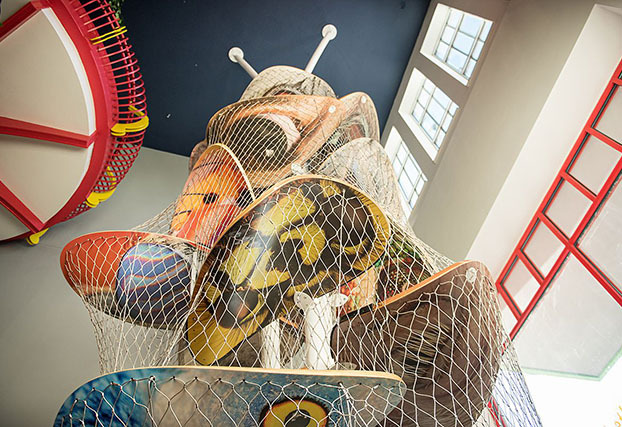 Children’s Museum of La Crosse, La Crosse, Wisconsin – Spanning two stories and featuring the eyes of 60 different animals highlighting the captivating beauty of the natural world. 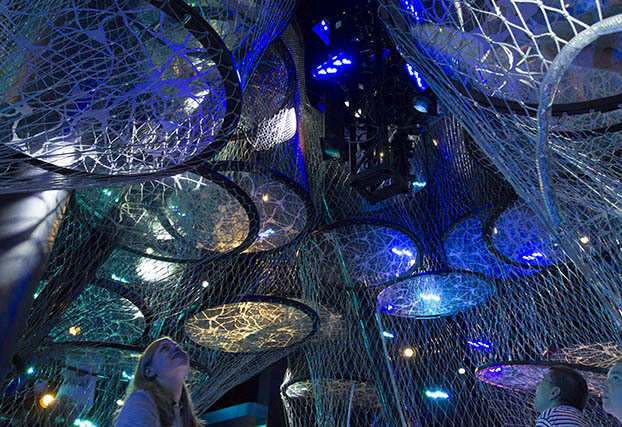 The Franklin Institute, Philadelphia, Pennsylvania – A metaphor for the interconnected complexity of the human mind, glass and light realize our boundless capacities. Mountains Edge Park, Las Vegas, Nevada – This Luckey Climber dramatically provides a gateway into the desert-edge of Las Vegas.